Contempt For Man, the debut LP from Swedish grindcore outfit AXIS OF DESPAIR – formed by current and former members of Nasum, Coldworker, Infanticide, Volturyon, Livet Som Insats, Nervgift, Overtorture, and more – sees release through Southern Lord Recordings tomorrow. Advancing its official release, Cvlt Nation is streaming the album in its pulverizing entirety. Contempt For Man dispatches twenty super-charged tracks of AXIS OF DESPAIR‘s brutalizing but hook-laden grindcore attack. The album surges with blasting percussion delivered with savage force, yet every hit finding its target with pinpoint accuracy. The blazing riffs leave charred scars in their path, while lyrically the band unloads their noncompliance with humanity’s declining ways. The album was recorded by drummer Anders Jakobson at Soundlab Studios and in the band’s rehearsal room Summer 2017, mixed at Studio Ülgnor by Johan Berglund, and is completed with artwork by Paul Romano (Mastodon, Circle, Hate Eternal). Stream AXIS OF DESPAIR’s Contempt For Man in its entirety at Cvlt Nation RIGHT HERE. 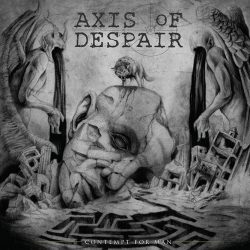 Following their recent performance at Obscene Extreme, AXIS OF DESPAIR will announce additional shows and tour dates supporting the album in the weeks ahead.